When children choose to become religious, it doesn't have to cost family harmony. I can still remember the feeling I had when my first child, a son, was born. He was planned for, wanted, gorgeous and healthy. I was transformed into another zone. I wrote a daily journal in his voice, dressed and redressed him up each day and repeated every wonderful thing he did to anyone who would listen. I felt that he was my greatest achievement ever. When people would ask "What do you want him to be when he grows up? ", I would simply answer, "Happy." I grew up in a secular household in the midst of the newest Jewish ghetto Toronto had to offer. Everyone I knew was Jewish, yet we never belonged to a synagogue. My brother was the only one who attended Hebrew school -- when he was 12 to learn his bar mitzvah portion by rote. It wasn't surprising then that my friends and family teased me when we signed our son up for Hebrew school at the age of four, which required a synagogue membership. The only synagogue in our city at that time was Reform, and we decided that it would be a good fit for our multi-cultural, inter-religious family. That was my first synagogue affiliation. Since my husband and I had agreed prior to marrying on the importance of religious training and that the children would be Jewish, I became responsible for the religious education of our children. To do that, I needed the help of a community. As I accompanied my three and four year-olds to services on Friday nights, I felt that I was the only one in the room who knew nothing. I knew none of the songs, the prayers, the bible stories -- it was overwhelming. Never one to back away from a challenge, I made it my mission to attend every week with my kids, took every Torah study, Hebrew lesson, and discussion group available until slowly, over several years, I attained a position of comfort. By then, with three little boys in tow, I started to take leadership roles in the running of the synagogue and felt a great sense of joy in having found a place that gladly accepted my odd mixture of a family; a place that embraced and taught and included us. I decided I would have a bat mitzvah to mark my 40th birthday and studied long and hard to prepare the Torah portion, haftorah and sermon. Afterwards, I decided to teach in the school to keep my skills honed. I taught beginner Hebrew to adults for many years and began to feel that I was quite learned. Each one, in his own way, fell in love with the land. I had always presented the after-confirmation trip to Israel to my sons as a given. One by one they graduated and made their trip, and each one, in his own way, fell in love with the land. Quickly, while I wasn't looking, the boys became young men and my first-born started his own personal spiritual exploration. His regular synagogue attendance and leadership roles in Reform youth group led me to believe he was a happy and fulfilled religious young man. However, as he became involved in the Jewish campus groups such as Jewish Student Association and Israel Committee, he found that things were done in a more observant manner in order to allow inclusiveness of all students. Slowly he began to question parts of his Jewish upbringing and gradually took on new practices. He attended conferences in New York, Florida, California and Israel. Although he taught at the Reform synagogue in his school's city during his first year at university, by his second year my son was attending the Orthodox synagogue and establishing a very close relationship with the rabbi. He waited to wear a kippah until he felt he could be a model for people who would identify him as a Jew. He developed a love for Israel and through his involvement in all things Jewish, managed eight trips during his university years. I watched all of this happening, trying to be supportive but with a fear of rejection and complications in my heart. Some couldn't help but tell me how it would divide our family. As his observance increased, my friends seemed to feel quite entitled to comment on this terrible occurrence that had befallen my family and pointed out all the problems that would arise. Some were shocked; others, angry. Some found it ironic that my child should become "religious" and others couldn't help but tell me how it would divide our family and end all hopes of a peaceful home. I didn't know if I should panic, fight or applaud. It was my Rebbitzen's mother, who knew my zaidy, who told me how proud Zaida would have been of my son's chosen path -- his courage and determination, and how proud I should be that I had given him the self-esteem and the unfailing knowledge that I would always stand beside him, with pride, wherever his path led him. So I stood aside and watched him blossom. We did have challenges and we butted heads on many occasions -- words were misinterpreted and feelings were raw, but thank God, over a period of time, we worked through the issues, and my husband and I came to realize that our dream for our son was coming true. He was happy! He glowed. He wrote about the joy of his learning and we could not miss it. We began to share his writings and everyone saw the same thing; he was so happy! Our friends and family began to show some interest in what he was doing and expressed admiration in his strength of conviction. So when he finally announced his intention to make Israel his permanent home, to marry there, study and raise his family in a religious setting, I had to be happy for him. By that time, he was laying tefillin, wearing tzitzit and a kippah, keeping kosher, had legally changed his name to his Hebrew name, was keeping the Sabbath and, most indicative to me of his dedication, shomer negiah (not interacting physically with the opposite gender outside the construct of marriage). I knew that how I reacted and presented to him could determine our future relationship. I looked at each problem my friends happily laid at my feet as a challenge, and quietly began to read and study and try to understand this life he had chosen and these people who would be an integral part of the rest of his life. I was also challenged by the distance and the basic differences in thinking. In North America we hoped for our children to do well in the world and that was measured by a secular ruler, in units of money. There, in Israel, his doing well is measured by his love of learning and serving God. There, he will work to live. Here, we live to work. After his aliyah, he sent me information of a learning program in Israel for women my age called GEM. Having only been to Israel once before, the thought of returning, studying and visiting with my Israeli son and his brother (who by then had been accepted to work on the Northern Israel Recovery Program with Livnot U'Lehibanot), was very enticing to me. Son number two had gone to Israel vowing that he was not religious like his brother and that he was not interested in being preached to. Yet somehow during his six month stay, he was studying with a rabbi, keeping the Sabbath, keeping kosher, wearing a kippah and tzitzit! I was very nervous. I envisioned myself starting all over knowing nothing, being on the outside, feeling "less than" again and the prospect left me filled with trepidation. I was determined not to conform to a dress and behavior code that I felt was disenfranchising to women. I jokingly promised all my friends that I would not return wearing a wig and reassured them that I was just going to hear what "they" had to say in order to better understand my sons' journeys. I arrived in time for Shabbat with my eldest in the Jerusalem neighborhood of Har Nof. We were the guests of his Rosh Yeshiva, head rabbi and another very wonderful family of friends for the three meals of Shabbat. I was given a room in the apartment of a young, North American couple, who had chosen to become observant like my son. All of my hosts warmly welcomed me and made me feel like an honored guest. This proved to be a recurring theme throughout my three week stay in Jerusalem. The women were modern thinking and looking. The men stared into their partners' eyes with adoration while they blessed them for the work they did in preparing for the holiday and they helped to serve, change a baby, and make a last minute preparation. They seemed to love to refer to their partners as "my husband" or "my wife" and there was a palpable electricity between them; a deep understanding of their feelings and needs without the need to explain, cajole or whine. They had learned that they could ensure they would be taken care of, loved and respected by their family, if they made their priority taking care of, loving and respecting their family. It was so simple and yet so profound. I kept looking for the terrible people everyone had warned me of... the ones with tunnel vision, a hidden agenda and a self-righteous attitude. The GEM program itself was a most amazing, non-threatening, enlightening experience. The daily schedule was grueling. We studied for four hours most mornings with amazing teachers and world-known rabbis, had field trips, visited renowned yet humble rebbitzens, and did a bit of touring. We usually finished our activities and returned to the hotel by 11 p.m. Much of our time was spent in the Old City of Jerusalem and it felt very special and very holy. I was witnessing incredible things, having unique experiences and meeting Torah giants -- in their kitchens! -- experiences and people that I never would have had or met in my world, and, most impressive and important, they were relevant. It made me glad that I had stepped out of my comfort zone. My ideas were never dismissed nor was I ever spoken to with anything less than respect and interest. There was never a derogatory comment or inference. I kept looking for the terrible people everyone had warned me of... the ones with tunnel vision, a hidden agenda and a self-righteous attitude, who would tear my child from my arms and never allow him to come home, but all I found (and I looked way under the surface) was a gracious group of individuals who were joyous and steadfast in their deep beliefs and ecstatic to share their joy and knowledge. I learned so much in the classrooms, at the sites, in the dining rooms, in the alleyways of the Old City and on the streets of Jerusalem. But even more than the studies and sights, the chance to see the community from the inside: to see the peace and love in the homes of the families who welcomed me on Shabbat; the total trust and respect of the families who gave me the key to their apartment while they were gone and left notes everywhere saying, "help yourself"; and the kind words from the many, many families who have fed and housed my sons, worked with them and taught them for the pure joy of sharing their knowledge; all these things brought me complete peace of mind about the decision they had made. I realized their choice was not a rejection of me and my ways, but an adoption of their own course. I realized their choice was not a rejection of me and my ways, but an adoption of their own course. No, I didn't come back fully observant, but I find myself taking baby steps, like making a concentrated effort to not speak negatively on Shabbat (keeping the laws of lashon hara). I am moving forward. I have a deeply satisfying feeling that my sons are on a good path and will attain the peace and happiness in their lives that we had always hoped for them. I feel so proud of them for having the conviction to take a road less traveled and choose the life situation that is best for them. At the same time, I indulge myself a little in having given them the self-confidence and character to follow their paths away from mine. I know that we will continue to have many more frank discussions over the years and will disagree on many matters, but with my new insight and their new peace, serenity and belief in the laws of Torah, we will work through each of the challenges presented to us. We know that the love we share is worth all the temporary heartache we may experience due to a lack of understanding, but that rejection, on either side, cannot be considered as an option. When a big challenge arises, I remind myself of that cute little blue bundle they handed me and my simple and naive answer to people who asked after my wishes for my child's future. I wanted him to be happy and he most certainly is. I envy you. It is now only religious Jews that contribute to the continuity of the Jewish people.In the US most of the Reform and secular Jews have married non-Jews. These are very nice people but 93% of their children marry non-Jews. I am proud to belong to the Jewish people and pray that it continues. In order for it to continue, children of Jewish parents must marry Jews. In the US such children must be religious. Here in Israel we are beginning to be in the same situation. There are now many non-Jews available as marriage partners and the many secular Jews here in Israel will probably marry them and thus end the continuity of the Jewish people. I grew up secular in the US as did my husband here in Israel. So I am very worried about the Jewish future of my grandchildren. It's only religious Jews here in Israel that we can trust to marry Jews and thus continue the Jewish people. Our secular Jewish children here will begin to marry very nice non-Jews here (from Russia and Moslems from here) and contribute to ending the Jewish people. Oy. You don't make any mention of your husband's place in the world you and your sons share. Are you still married? Is he accepting your new enthusiasm and your sons lifestyle/identify. Thank you for sharing! I feel very strongly about this, having watched it happen to dear friends. I think aish is a cult that corrupts and destroys families and lives. These poor children who had their whole lives ahead of them to be open minded successful people now are slavish cult members living in a backward society ruined by this awful organization. I wish I could do more to stop your outreach to vulnerable children whose lives you ruin. This story, and others like it, that try to dress up destroying families in a religious bow make me so angry and sad. Your quotas, your tactics, all very disheartening for a jewish person like me. Embarrassing and wrong. I realize this comment will probably never be posted, but I hope someone reads it and realizes down deep that what you're doing is awful. Destroying families and praying on vulnerable children is awful. You see that your comment was posted. We orthodox Jews do not censor, like you think! I want to tell you that I took a journey like these two boys. I grew up in a Reform home and I have been living a fully orthodox (and fully satisfying) life since the mid-90's. My parents and brother did not follow me, but I am as close as can be with them. In fact, I think I am even closer to them than if I had remained non-orthodox because I take seriously the mitzvah of honoring my parents. I speak to my mother everyday and keep in touch with my other relatives as well. 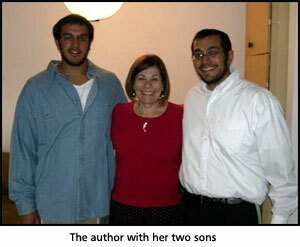 My rabbi husband is also close to my mother and considers himself her son. Since we have taught our children to respect older people because it is a mitzvah, my children are close to my non-orthodox relatives and very respectful of their wishes. My mother is proud of them and has told me many times that her friends are jealous of her because their family relations are so bitter and broken. Aish is not a cult. All they do is present information that is well-rooted in history and tradition and their audience is free to make their own choices. You can see from the author's children chose the orthodox lifestyle freely and were not exposed to the typical brainwashing techniques. I think Jewish people like you have a lot of stereotypes would do well to open your minds to explore other ways of thinking and living. I want to wish you hatzlacha (success) on your journey! you don't mention if you physically went to Aish yourself to save them ... did you? Were you open minded and said to yourself "hmm.. if my close friends say their is something here, let me check it out for a month... at least I'll be intellecutally armed to save them since I care so much for them!" From your letter we don't know if their families were "destroyed" by these young men (if so, that is regrettable and not the way to treat family) or if the families didn't respect their children's own choices to be observant. Our duty to follow the path that God guides us down. I thought Heather's story was beautiful. God takes each person pursuing Him down a unique path. It is our responsibility to follow God, not the pressures of family, friends, acquaintances or even organizations. It is harsh judgement to say Heather ad her sons are not following God just because they do not walk your secular path. I have walked a path where God has challenged my upbringing (traditional evangelical Christianity) and shown me the importance of observing and living Torah. After 22 years on that path, I am more Jewish than Christian. In organizational terms I am closest to Karaite Judaism, but I have not converted as I need to have that leading from God. I must assume that your definition of a destroyed life is based on how much money one makes. If the boys are living in Israel, they're not likely to be millionaires, but with a college education behind them, they're likely to make a living. Surely observing Jewish law can't be your definition of a destroyed life, because we don't see secular people to be any more successful than Orthodox Jews. Hollywood destroys lots more families than religion ever did. I don't know what stories you've heard to call Orthodox Judaism a cult, but they are not representative of the real society. There are groups of ultra-Orthodox who shun modernity, but AISH does not promote those messages, so your accusations are misplaced. Heather, this article was such a wonderful read. I have worked with college age students studying Judaism here in Jerusalem over the last 23 years. Not always do parents have the emotional bandwidth to let their kids explore. It is encouraging for all of us who work here to "meet" someone as genuine as you. May you have only nachas from the family! What would have happened had my parents given up on me and I given up on Judaism? I'm rarely aware that this article is running once again. That is why there usually is no response or, none is needed. This mother was writing about a happening, not on the good or bad scale...a happening. This time, however, I saw it and, I couldn't resist. Had my parents taken the stance that I was dead to them, for marrying outside the faith, and had I therefore, turned my back on Judaism, not only would my 3 Jewish sons not be Jewish, but my 3 Jewish grandchildren wouldn't be either. And how could a parent self-inflict the pain of the death of a child by cutting them off or sitting shiva for them? Wouldn't one who believes in the over riding power of Hashem find that action to be overstepping their boundaries? Shouldn't that be up to the higher power? There are so few of us Jews. I find it so sad that some look at differences instead of our commonalities. Don't we have enough enemies in the world? Is it only during wartime and adversity when we band together. For G-d's sake! Do you feel happy when your children fight, squabble and pick at each other? Take the giant leap, people. To use the vernacular...'nuff said!! They know better. They just don't want to. That's the thing. Religious Jews remind some secular Jews of what it is to be Jewish. Not just Chinese food and movies on Christmas Jewish but to be committed to the Jewish people and part of a 4000 year old culture. We remind them that they do not keep kashrut or keep Shabbat or the myriad of other things that being fully Jewish involves. We don't stand on the street corner like a crazy Pentecostal preacher screaming of hellfire and eternal torment. I don't say anything. Unless asked-then I'm nice, but not apologetic. It's just the visual reminder that we exist that troubles their consciences. If everyone simply became secular than those questions they ask themselves subconsciously would just go away. The other thing is that religious Jews with our funny dress and outdated "traditions" embarrass some secular Jews. In a place like the US where conformity to the predominant consumer based culture is paramount many Jews are simply trying to fly under the radar. To reduce their Jewishness to something more akin to being Irish. Like Irish Catholics that have their church on Christmas and conformations and corned beef ethnic Jews have Bar Mitzvah and Pesach and pastrami on rye. Any more would stand out...which is hard. The worst thing is when some secular Jews get a little taste of Jewish life and it triggers something within them. It feels right. They finally truly belong somewhere. They have to deal with how good it feels and work twice as hard to damp that down so they can continue to live the life they feel is normal and comfortable. They want to continue to feel good about the bacon wrapped shrimp with ranch dressing they grill at their kids soccer tournament on Saturday afternoon. I get it. People have choices. I'm just not interested in apologizing for my lifestyle choices so that others can feel better about theirs. G*d bless Chabad. They do the work I have little patience for. I can say with 100% certainty that I remind one of my siblings what it is to be Jewish. This particular sibling is very frightened by the changes I have made, and sadly I cannot discuss Judaism with her AT ALL. (She loses her temper with me). I was raised in a very Secular background, and had precious little Jewish education. My parents, z"l especially my mother spent her time running further away from Judaism the older she got. Thankfully I have a great support network of my observant friends, who cheer me on every time I take the tiniest step up the ladder of observance. You mentioned having patience. It is something I daven for on a daily basis. Sigh. What about when kids leave religion? I've heard stories about parents struggling to cope with their children's religious lifestyles but I have yet to read about parents coping with the opposite experience. As someone who grew up in an Ultra Orthodox environment, I decided to leave the path of religion for various reasons. Needless to say, it devastated my parents but I had to do what I felt was best for me. My choice did rupture my relationship with my parents and they haven't yet accepted my decision to live a secular life void of religion. My siblings have practically written me off. People like me have no place in religion. I have been vilified for my choices and castigated for putting my siblings shidduch prospects in jeopardy but I didn't want to spend the rest of my life living the way people expect me to rather than being comfortable with who I am. Although leaving religion was hard for me and my family, I felt it was necessary. We may not always like nor agree with the decisions our children make but we need to come to peace with them and accept the circumstances for what its worth. I believe there actually are articles about sons and daughters who go off the derech, but nobody reads those articles on aish.com to feel inspired and happy. The above article is about a mother coming to terms with a GOOD thing. It has nothing to do with the tragedy of one's child abandoning faith in G-d and turning his back on you. So try looking for such an article in the sad section of aish.com, where losses such as deaths are discussed. What is so tragic about leaving religion? I don't agree with you that leaving religion is a tragedy. It's a personal lifestyle choice like any other. Yes parents may be shocked by the different paths their children chose but calling it a tragedy is a bit exaggerated. What I find shocking is that you think people like me are sad cases. I don't find leaving faith to be depressing. I can assure you that there are plenty of people like me who are content with our secular lives and therefore feel that religion isn't necessary. We are not sad people. If you wouldn't lament over the fact that you child didn't choose a career path you wanted him to follow, then why should it matter to you if he decides to leave religion? Despite what you may think, I do feel that my experiences and journey serve as an inspiration and example for people to make their own choices. We control our destiny. You can't make choices for others. It's not for you to decide who should be religious and remain as such. Religious coercion is never the solution. It just pushes people away. Only the person him/herself has that prerogative to make that decision. There are certain aspects of life that I find disappointing but leaving Judaism isn't one of them. I am sorry if that disappointed you. Personally, I find children getting hurt or people disrespecting the law to actually be tragic but that's just my opinion. Some religious parents view their children’s choice to not be religious much the same as if they had committed suicide. It's true that they made their own choice, but the harm that the child inflicts upon himself is tragic nonetheless. Anonymous - I wish you the best! And don't think that you have no place in religion. You stopped being observant - that doesn't mean that you stopped being Jewish! And just because you are my fellow Jew, I love you. The G-d that you do not believe in loves you too. Please remain open to the possibility that the way that your parents presented Judaism, or the way that you perceived it, is not the same as true Judaism. You rejected the Judaism which you knew. It's possible that there is an entirely different Judaism of which you are unaware. One cannot say “I know what Judaism is, and I’m not interested,” unless she truly knows what it is. I'm sorry to see that you've been attracted to the glitter of worthless cheap stones rather than the real thing.In this woman's account we rejoice for her because even though she did not have the privilege of an observant upbringing, she was lucky enough to find meaningful ways that she could connect to her roots and, thus, connect to her sons and her heritage.However, you had those privileges but threw them away. So sad that you took down the rest of your family with your self-centered excursion. You may be comfortable now but I hope, for your sake, that someday you'll return and I'm sure your parents, who are partners with H' in creating this wonderful person that you are, will welcome you and accept your teshuvah. Best Wishes for a refuah shelaymah. b'nefesh. Come back! We'll welcome you with open arms! Come back! Come back! We love you! What a wonderful, detailed account of your son's journeys and yours, too! Our family has embraced our daughter and son-in-law's choices and we now have 'mobile Kosher kitchens' in Newport and Tampa so that we can all eat together during holidays and vacations. (They live in NY). We have 4 beautiful Orthodox grandkids now who are very knowledgeable about all things Jewish. We're so proud of them all! Please give Heather my phone number 972 547 663409 or email address. My mother wrote the book Black Becomes a Rainbow. Heather's article reminds me so much of my (departed) mother and her joy in my chosen lifestyle. I would love to speak with her. I am a young Baalas Teshuva girl and I read your departed mother's book. If its possible I would also like to get your E-mail address so I could talk to you and ask you a few questions. I have your mother's book on my bookshelf. I greatly enjoyed it numerous times and have let other read it, too. You were very blessed with your parents' love and acceptance. To Mr. and Mrs. deSilva, enjoy your family and delight in your children's growth and progress. Best wishes. you're awesome! may you keep growing and have blessing always! WHAT A GIFT YOU HAVE GIVEN YOUR SONS BY OPENING YOUR MIND AND YOUR HEART TO WHAT THEY WERE DOING. YOU GAVE THEM WINGS AND LET THEM SOAR WITH YOUR HONESTY, COURAGE, AND THE MOST BEAUTIFUL WISH THAT THEY BE HAPPY. MAY YOU ALWAYS HAVE "NACHAS" (LOOSELY TRANSLATED - PRIDE AND GRATIFICATION) FROM YOUR ENTIRE FAMILY! Every person finds their path.Happiness is the desired goal.It is always fear of the unknown,that scares us the most.You don't have to agree with your children's choices,but you should open your heart and mind,and respect their values. I recently read an article in the hamodia newspaper in which a young man approches a rabbi asking for help. he needed help since he wished to practice judaism and his family pushed him away for it, and his wife had left him (reason not mentioned) with the children and he felt all alone in the world. he wanted the rabbi to restore his believe in humanity. I am not going through my long story but my husband and I are the only practicing people in both sides (we both practiced on our own prior to meeting), and I cannot believe what I hear form 'family and friends' because we practice. I tell myself to be strong and that is it. I love judaism and this is why I continue it. I have my believe in Hashem but not in humanity; I don't depend on man (sort of like what is written in birkat hamazon). I know people need people, but I feel that I have really tried and ... anyhow, it is nice to hear that in this story the mother is accepting. to the author (and I am speaking from experience), the USA is HOME and I support it; and Israel is the spiritual home, and I also support it. moving to Israel does not mean that it is bad somewhere else as stated in the article. all the best of luck as I have been blessed, even if it has been tough. It is always wonderful as an adult child to get encouragement from mom. Sometimes mothers are not aware of the power that they have over their children. I only wish I had your "problem." My children are running as far away from Judaism as they can. I, too, wanted them to have the joy I feel for Judaism. Instead, they only have disdain. You are very lucky. So many people turn their backs on so much, as they have some wierd visions which are baseless. Many listen to gossip about other people and some try to find a way to make sure they know in their mind, that a person is on the wrong track. I relate to this and am moved by your great article, spoken from experience but with many triggering truths. I myself have people telling me to change course and steer away from religion, but only greatness comes from sacrifice. Would everyone be as happy if the boys became less religious? This sounds like a wonderful story, and kudos to the mother for allowing the sons to choose their own paths. But I wonder how everyone responding would feel if the boys chose a less religious path. I hope we would also be as supportive, realizing the boys made the choices. My zaide also would be proud of the sincere observance my sons have adopted. Thanks for sharing your experience. Funny how the pendulum keeps swinging. I thiought that your article was beautifully written and I am thrilled that you were so accepting of your sons. However, I am wondering how you would have felt if they had been daughters. Wow! That was beautiful! Thank you! The key was that you and your husband decided to raise your children to be Jewish even though your background was weak. And you showed an interest early on. My parents were very negative and fought me. You are the mother everyone dreams of! May G-d continue giving you strength and clarity, may you live a happy healthy life so you could continue shlepping more and more nachas from those two happy men! Thank you sooo much for writing this article. It so profoundly captures the journey of so many of our parents (parents of baale teshuva). You are an amazing lady! Whata beautiful and moving article. You and your family demonstrate that all Jews have a "Yiddishe neshamah" that just need nurturing and knowlege. I wish you only happiness and continued nachas from your sons. As in marriage, it takes two to make it work. Heather, your spouse and your children all "wanted" it to work and were all open to understand and listen. Your love to each other is greather than the differences and how blessed are you all to continue loving and respecting each other despite the diferences! May Hashem bless you all. Thank you for sharing your journey with us. What an honest, articulate and moving article! Thank you! May the Almighty bless you with continued nachat from your family. Your sons are GEMS. I knew the first when he was 'Brandon' and then when he was Catriel, and then when he was a Chatan and now that he is a father (updates coming much more infrequently- but i was a mom of a baby or two myself!) I have also met another of your sons in Hamilton and he seems to be such an incredible mensch. I can tell you that however religious or not religious they were growing up, the MEN that they became are because of everything you gave them, and that you did an awesome job. If you ever want to come to Hamilton for a 'Shabbaton' with friends who already love your kids, no doubt we can find you lots of hospitality! I hope they are all well and happy and that you are enjoying your own path as well! Heather, Your article is truly inspiring and indicative of how active we must be in guiding our children's direction while slowly letting them move forward with their own lives. Growing up in the predominantly Jewish area of Milwaukee, WI, there was no shortage of shuls, kosher butchers, "Hamishe environments", visiting scholars and contact with Rabbis. Nevertheless, I felt that religion was crammed down my throat and allowed me very little leeway; I remember stating that 'when I have kids, I'm not going to subject them to the same thing' I went through. Right. Our son was on the waiting list for admittance to the Milwaukee Jewish Day school by the time he was 2 years old. Eight years later, he graduated into a public high school comprised of so many Jews that the school had to close for all the holdays because only 15% of the students AND TEACHERS would be there. Our son has continued with his Judaic education, studying with a scholar at a Kollel in Chicago. He went to Israel on Birthright a year ago and is planning to go again on another program this December. He speaks fluent Hebrew and has kept up an online conversation with a girl from Haifa. I won't be the least bit surprised if he finds his beshert in Israel; he's deeply moved and emotional when he talks about Israel. One more thing. In the final analysis, there are no divisions amongst our people. The labels "Orthodox", "Reform", "Recon- structionist" are for convenience. We are ALL Jews. May you and yours have nothing but nachas - and enjoy many years with your sons, daughters-in-law, grandchildren and, G-d willing, great-grandchildren. Your article touched me deeply. How proud you must be to have bourne a spark of divinity in your son(s)soul. I am not Jewish, but admire any person for being committed to God and their religion to the depths your son has. God Bless your sweet family. Many times, I have heard from non-religous Jews who "know" how the orthodox feel about them, without ever having spent time among the orthodox. I think it takes courage to stand up to the prejudice, go among the orthodox, and see for yourself what the truth is. Continue to spread your story, your new understanding, and help fight the misinformation! I have been among the orthodox my whole life, although my family (and myself) may not have been at that level of observance. I have never met an orthodox Jew who looked down on the non-frum, and I have also never met a non-orthodox Jew who was able to give me an example of someone they had personally met who "lived up" to the prejudice and treated them disrespectfully just because they were not orthodox. Wonderful article and advice wanted. Hi Devorah. I'm glad you have had such positive experiences in your life. Until a few years ago I was not religious to say the least. In the last few years I have been becoming gradually more observant. I now attend synagogue weekly, keep kosher, and am trying to become more Shabbat observant. I have gone back to college this year and as a result, live a fair distance from a Jewish community. My goal is to be ready to be fully shomer Shabbos when I finish my degree in a year and a half. As I will then be able tomove back to a Jewish community. Right New I dive over 45mins to a kosher supermarket in the city, so that I can buy my meat and other kosher products that I can get in a small college town. I have usually had good experiences with orthodox Jews. The orthodox Rabbi who hosts Torah on Tap every month is warm, relatable, and inspiring. The Chabad rabbis have been nothing but nice and Partners in Torah hosts many wonderful and educational events for young Jewish adults lie me, who are trying to bring more Torah into their lives. The only negative experience I have had is when I shop at that particular kosher grocery store I mentioned. A great deal, though not all of the customers that shop there are orthodox and I consciously try to be careful about what I wear. Though I don't think I actually own a skirt, I always try to dress extra modestly while in the store, out of sensitivity to others. Despite my best efforts however, I constantly get what I perceive to be dirty looks from other customers. It's very frustrating for me, especially after having driven so far to do my groceries. I've found that I truly love keeping kosher (despite the complications that result when I visit my family, who do not) but the repeatedly negative experience in that store is very discouraging. I can't think of what I'm doing wrong and don't want it to ruin my impression of the orthodox due to that. Does anyone have any suggestions for handling the situation? Adira, I am so impressed with your initiative and steadfastness as you develop your commitment! Your sense of being stared at negatively may be only in your own head...it may be these are simply curious stares coming from perfectly nice people who are wondering: "Here is a woman dressed not so according to halacha and yet gone out of her way to shop strictly Kosher! Wonder about her..." There's no way, really, to expect people to know or guess your story without you informing them. Ideally, however, your message should serve as an instruction to all us mainstream frummies to assume that the person we are "staring at" may be an amazing story in progress as you are, and to offer warm respect, friendship, (and help if needed). One thing, if there could be anything, might be that you are wearing something really low-cut?? But even so, I somehow can't picture people giving you mean looks for that. More likely, people would tend to look away. Maybe I'm naive on this, but I tend to think it's the first scenario. Smile and strike up a conversation with the next person who seems to be staring, and break the ice! Say you are learning about kosher products and ask for help in the chicken dept...that kind of thing. You may be happily surprised! much luck...I'd certainly be happy to get to know you. I loved this article. I keep coming back to re-read it, and see if anyone else has displayed any comments. It gives me so much hope for our family who has intermarried, and those in our family who are only now after many years accepting that this lifestyle my husband and I have taken on for ourselves is not going away like some 'silly habit.' Kol HaKavod! I really enjoyed reading this article! Thank you! I also experienced that it's a wonderful atmosphere around observant people and I like to meet with such people. You mentioned that your Zaide would have been proud of your son(s). I think he would even be more proud of their mother, who tackled this issue with the same good sense, courage, and dedication as she did when she reconnected her family to Judaism when they were little. Your are a very special lady. Your children are lucky that they have you as a mother, because at least in part, that is why they have had the courage and dedicaton to pursue such a beautiful but challenging life direction. Keep learning, and take things one step at a time. It all works out in the end! That was a beautiful story and one very typical of what most Balai T'shuvah go through (including my own relatives and friends). Your children are quite lucky to have such an accepting and supportive mother. My third son visited Israel with Birthright after high school and stayed on a kibbutz/ulpan program for eight months. He fell in love with kibbutz life and although at home now, plans to return to live that life at some point in the future. At 21, he still has things to do and places to see first. I didn't expand on the situation with my husband as it seemed to be out of the realm of my piece. I was asked to write about my intermarriage experience and am considering that, but for now, in answer to some questions, he has always been a very supportive and involved parent to the boys in all facets of their lives. Actually, he was the one who found Solel, our shul. He was very involved in the Brotherhood, bowling and the children's education as well as social and charitable events. In our community, the shul is the place of worship, religious school and social centre for all things Jewish. All of our friends from this city are synagogue members and he has become part of the community in all aspects except for religious; something possible in a Reform community. He took a one year long Jewish Information course in the year between our two oldest sons' bar mitzvahs and is informed about our Jewish customs, holidays and beliefs. Ours is a Jewish home. He respects the boys' choices and celebrates their happiness as they respect his holidays, traditions and the fact that he has carried on with them, on his own, throughout their lives. He's wonderful, genuine and has such a warm heart. I'm incredibly happy to see him so happy. He is by far one of the greatest memories of my trip. I loved reading this, it's so wonderful to see a mother learn and be so open. I wish you luck in the future - thanks again for this and for raising a great son! I always said if my kids wanted to be more religious than me, I would be cool with it, as a totally secular person. i figured that i was a weak link in the chain. we know your son and the community in which he became more observant. it is an amazing community and we ourselves have become more observant, in babysteps like you. It is always somewhat uncomfortable to celebrate in the prsence of someone who is more ore less or differently observant than ourselves, but beautiful if we can do so with love and respect. I have Jewish friends who are extremely observant, many who are less so in varying dregrees, some who are messianic in a christian type sense, and many who are non- observant. Somehow we are all able to celebrate our Jewishness, worship together at times (yes, even the non-observant ones wish to be a part of it at times! )and share what is meanignful to us. I am so glad you found this love wiht your sons. What a journey! This has to be one of the most enjoyable readings I have come across in a long time! I love everything about it. I'm glad that you were so strong not to let the comments of others influence how you handled every thing. What a beautiful story, you're acceptance is amazing, and may all parents of baalei tshuve be open to learning and understanding like you! Your sons probably appreciate that you gave them an introduction into judaism that they would not have had, had you not at least introduced them to Reformed Judaism. Had you not, at least, introduced them to Reformed Judaism, they may still be secular. You enabled them to take the next step. you have so much bitterness in your post. I hope that one day you can talk to your sister, tell her how you feel, and listen to her when she talks to you. Be proud, you earned it! To R. Devlin: You express bitterness that your sister and her family have distanced themselves from you due to their religious beliefs. Yes, it is regretful to see families divided but on the other hand, your daughter intermarried, indicating that real Judaism is not an important factor in her life. How could you expect your sister to celebrate that? The main difference between you and your sister is that her children and grandchildren will remain proud, knowledgeable Jews whose main allegiance is to their centuries-old heritage. Unfortunately your grandchildren, although halachically Jewish, will probably not be. Contact with their authentically Jewish cousins may help them realize what they are missing. I became a Bat Mitzvah very recently; and feel more a part of my temple. The journey you've made is remarkable; but I must ask about your husband's role in your own journey and that of your sons'. I don't know if you left him out, as this was 'your' story-telling style; or if he took no role in your family's spiritual growth. My own husband took a very active role in my studies and joins me in my temple activities; so the absence of mention of your story was very jarring to me. This may well be a question that is too personal to ask and I humbly apologize if I have over-stepped the understood boundaries of commenting. What happened to your third son? Is he going to live in Israel as well? Your children are incredibly lucky to have you as their mother. May you have lots of Nachas from both your sons, and may you see their children and even grandchildren being raised in the ways of your Zaide! Kol HaKavod to you. how wonderful to hear from another Mother! Heather, I really enjoyed your well-written, insightful article. Your sons are indeed very fortunate to have such an understanding mother. Unfortunately not all baalei teshuva are that lucky. When my husband first became religious, his secular Jewish parents gave him a very hard time. Although their attitude did soften over the years, especially after we gave them grandchildren, it still was not easy. Kol hakavod to you and your sons on your spiritual journeys! Hi, I read with interest the story of your journey and that of your son's. Maybe it is a tuning fork, that fork in the road, because each of us does march the the sounds of a different drummer and we are pulled in varied directlons on the river of life. I do not, in my middle age, feel that one road is necessarily better than another and I do not fear for the roads my children have taken and this is because I know their hearts and for me, the spirituality of gold has to do always how we are with each other, whether we are Jews of various stripes, or Muslim, or Christian.... The bottom line has to do with a sensitivity to each other and to the environment. If we have this, we have it all. The world is a big enough place for us all, as long as we do not judge each other and as long as we value each other and that diversity exists for excitement, for dialogue, and for LOVE. I am glad your son found love and community in a faith and tradition he has chosen. Surely he got to JOY, a mother's fervent wish for any beloved child. KUDOS TO YOU FOR BEING OPENMINDED AND FOR TRULY WANTING THE BEST FOR YOUR SONS! MAY YOU CONTINUE TO GROW TOGETHER! What a great article! Thank you for sharing your experiences. Toronto is an amazingly good place to be Jewish outside of Eretz Israel, so so good! You've been blessed over and over. May your blessings continue. A very nice article and well written! May you Mrs. deSilva, continue to grow within YOUR Judaism. I wish the best for you and your beloved ones! Thank you for writting this article, it is trully inspiring to hear from parents who do understand and admire thier children's path in life.